We fell in love with Hope Cove in 2007 and have been holidaying here since then. 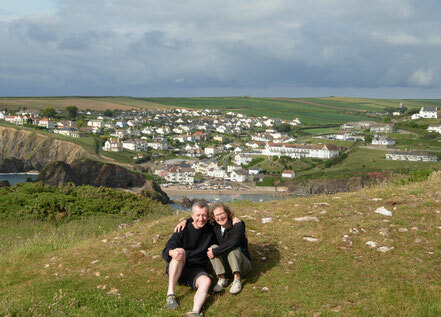 In 2014 we took an opportunity to have a sabbatical (our 'mid-life crisis' gap year) and spent the year in Hope Cove. Walking the whole of the South West Coast path, and settling into the local community has led us never to go back and Hope Cove is now our permanent home. We bought the Waverley property at the beginning of 2016 and spent time refreshing 'Little Waverley' to make it into the perfect holiday retreat - we hope you enjoy it! Please see our 'Booking' page for availability and to make a booking enquiry. Alternatively, please call us on 01548 562106 or complete the contact form below and we will respond as quickly as possible.